Lifetyme Boats has a number of in-stock Landing Crafts with T-top or consoles. These models are great for loading and unloading equipment from the bow door opening. Our Work boats with push-bumpers are great for pushing barges on locations, hauling work crew, bridge inspections, etc. Bottom runners welded not crimped in hull. Our Patrol boats are set-up with siren and light bars for patrolling lakes, rivers, and coast waters. Rescue Landing crafts are design with folding down bow doors for hauling ATV vehicles and for diving teams. Barges can be installed with Hydraulic Cranes, folding down platform, dump system, etc. These barges are used for pick-up buoys on rivers. Order length and width needed. Lifetyme Boats offers top-quality custom built Landing Crafts and Deck Barges and Work Boats for commercial use. We also build Government and Rescue Boats custom built for heavy duty! Copyright 2018 Life Tyme Boats. All rights reserved. Life Tyme Boats, Inc. has been a family-owned boat building business since 1985. All of our boats are custom made to client specifications or government contract. These are strong, heavy aluminum boats with durability and safety in mind. Even boat building is subject to new technology, so we keep a constant eye on upgrades and new methods. For instance, at one time Life Tyme boat design was done at the old-fashioned "drawing board." Nowadays, new designs are produced using 2-D and 3-D CAD software. Although we're located in Louisiana, we have customers as far away as Alaska, the Florida Keys, the Bahamas, and the Virgin Islands. And we deliver! Hours of Operation: Monday-Thursday 8:00 am to 5:00 pm, Friday 8:00 am to 3:00 pm. 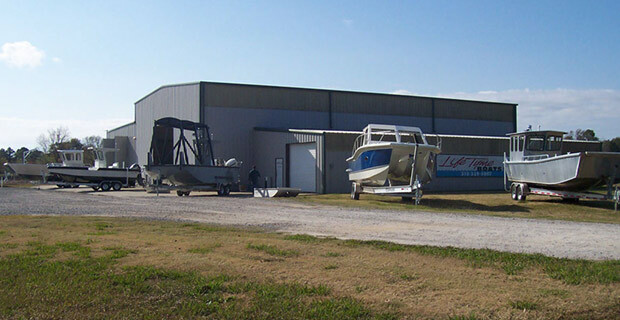 Our boat manufacturing site is located just a few miles east of Jonesville, LA on Highway 84.